I found the Lindsay's sharpening very easy and fast to use . I think about the good way to make a point to do goldinlay with facility. I study differents angles appropriated for airgraver and I create this point. I think it will be good for all people to use it and I ask to Steve to create a template with this model of point for all engravers who want to do goldinlay. Steve have tried this point and he confirm to me this template works great. With pleasure I announce to you that this template coming very soon. Re: Sharpening for goldinlay point. Steve, a small suggestion if I may. How about writing a little description about different points to your sharpeners web page? When I look at those different points, I already start to wonder what's the big difference in those. Even more so might wonder the people who are first time on your page. What's the difference in 'regular' Bulino and 'Coggan bulino'? What will be the difference in regular flat and Baptiste inlay points? When should I use which? Roland is the other side of the point flat or with a heel ??? Hi Vilts and Jerry, I've been meaning to do that. I'm just frankly short on time keeping up but this is something that would be super to have done. I wonder if people that do understand the various uses of these would want to help and write about them and I can jump in when needed. Then, later I can update the page or just provide a link to here in the engraving forum. There is an additional template that was finished a month ago and that is ready to be sent out, but I haven't had a chance to add it to the site. It is a round bottom template. There is also another bulino template that will be ready by the end of the week together with Roland's template. It is bulino point that Dario Cortini from Bottega Incisioni Cesare Giovanelli in Italy uses. After trying a PalmControl (thank you Philip George!) Dario purchased a PalmControl and provided his sharpened bulino graver through Phillip so that templates can be made for it. Dario's bulino point is similar to Phil Coggan's but slightly different. The 70 degree bulino template is one that Ray Cover recommended and I believe others are using a narrower graver like this for bulino too. The bulino I always used was just a 90 without a heel. Dario's and Phil's are similar but they grind them tapered on the bottom rather than the top so that the point digs in better than mine ever did. 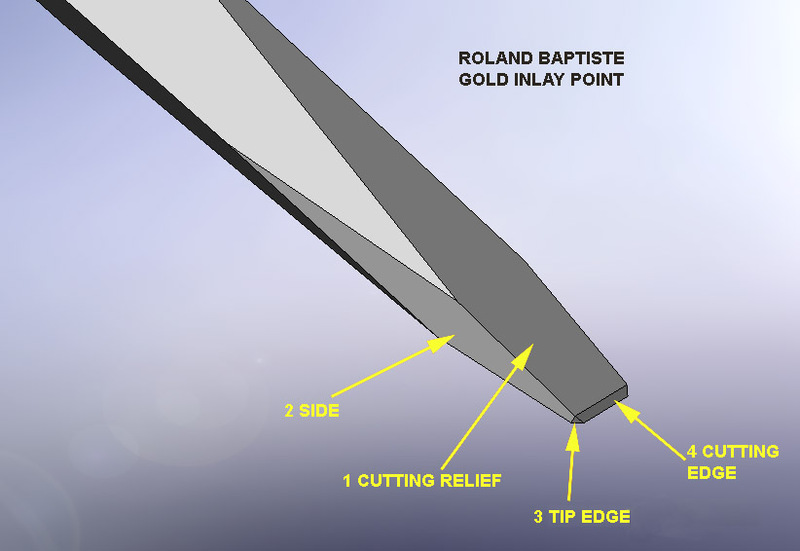 Roland, would you have time to write a description of how you are using your gold inlay chisel? 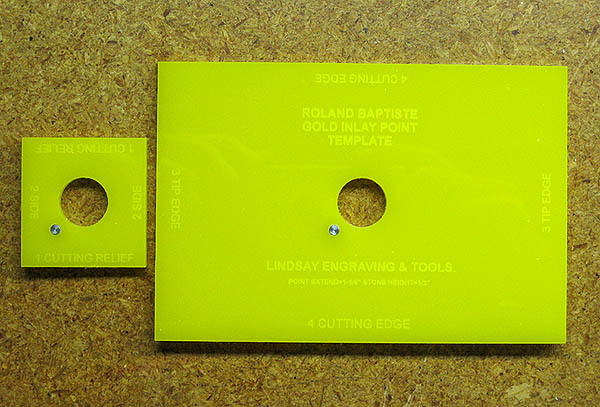 On Roland's template we are writing numbers on the edges of the template to help people determine an order to grind the facets. This point is using to make the inlay with all material (gold, silver,...). You can make relief and flat inlay, it is the point used in Europe for goldinlay, this tools don't cuting, it just push the steel. The difference with the undercuting used more in Oestrich and it cuting in your line. With undercuting, I feel is more difficult to use because you musn't touch the other edge of your line. With my point, I study the good angle to have easy to progress into the line and for don't touch the other edge when you advance. This point it is a symetrical point. You can see here the step to sharp it with the template and how use it. Into the Pauls contest submission http://www.engravingforum.com/showthread.php?t=2234 Paul explain the technic to goldinlay ;-) and it is not necessary to explain again ;-) because his tutorial is very good. Thanks Paul. Steve write on the template the number of the step to have the good way to well sharp. You must just following the number ;-) it will be easier. Don't hésitate if you have more question. Thanks Roland, These pictures are helpful to see. At what angle is inlay point used to make the undercut in the pocket for the inlay? And I see from the picture it has a heel,right?.As in picture numero 6 does one just make the cut and set in the Inlay? For made the "undercut" you just put the point into your line at 35-40 degree and incline it a little on the left or right to advance. If you incline more you advance fast. You must do that in each edge of your line. Roland's inlay templates are cut out and ready to go. Here is a drawing with lables to the facets that correlate with the lables on the templates.